A New Year's Challenge For Me...and You! The Lord has used a few friends to encourage me lately and it got me thinking-what if I responded to every prompting from the Holy Spirit to encourage my friends and family? I want to be a wife, mom, daughter, and friend who encourages those around me. What if we as a culture truly desired the best for others and did not look at everything as a competition? Instead of being jealous or upset about something someone has, or how they look, or how amazing someone else's kid is, let's choose to bless and edify one another. I recently heard this quote and thought it was so profound. "The reason we struggle with insecurity and do not encourage like we should is because we are too busy comparing our behind the scenes with someone else's highlight reel." Can't you relate to that? For me personally, I may not feel the need to encourage someone because I am only looking at their "highlight reel". But, when I take the time to be in relationship with others, I realize that at the end of the day, we are all battling something... therefore, we all need encouragement. Will you join me in the New Year and choose to encourage, bless, and edify those around you? I can only imagine how the Lord will bless our efforts as we choose His ways in 2013...just think about the number of people you could encourage in a year's time. That is pretty exciting to me! Build up hope so you'll all be together in this, no one left out, no one left behind. I know you're already doing this; just keep on doing it. Today was a day full of perspective. I sat and watched a teenage girl with Cerebral Palsy have the best time at an arcade game, even though it was incredibly difficult for her to play. She laughed at herself trying to hit a button just right, while her dad grinned ear to ear, shaking his head at her tenacity. Her determination encouraged me and I found myself also grinning ear to ear...all I could think was, "this young girl just made my day and she doesn't even know it!" She is blessing others, just by being herself...isn't that what we all want? And, I my heart has been heavy today, praying for and thinking about a family we know who is doing the impossible...saying good-bye to their precious daughter who went to be with Jesus on December 23rd after battling NKH for 7 years. This family has been a huge encouragement to us the last few years, even though we have only met them once, for a few short minutes. Through social media, we have been able to connect with their family and witness their passion in fighting for children with special needs. To see the way they remain faithful to the Lord and their family, in the midst of so much trial, has ministered to our hearts so deeply. I have also shared some of their story on our FB page and numerous friends have messaged me, just to let me know how powerful their story is and how incredible they are as parents. I could not agree more. So, I am challenged today to keep my eyes fixed on Jesus, make time to take in the blessings before me, to just be myself, and pray for those who need to feel the Lord's embrace, comfort, and peace. We have had so much fun this year celebrating Advent! A few of my favorite days have been: The Live Nativities (Racine Christian Church and Grove Dental Associates), Rhema Bible Christmas Lights, Having a Worship/Dance Party in the Boys Room, and Making Christmas Cards for the Elderly and Delivering them at a nearby Nursing Home. 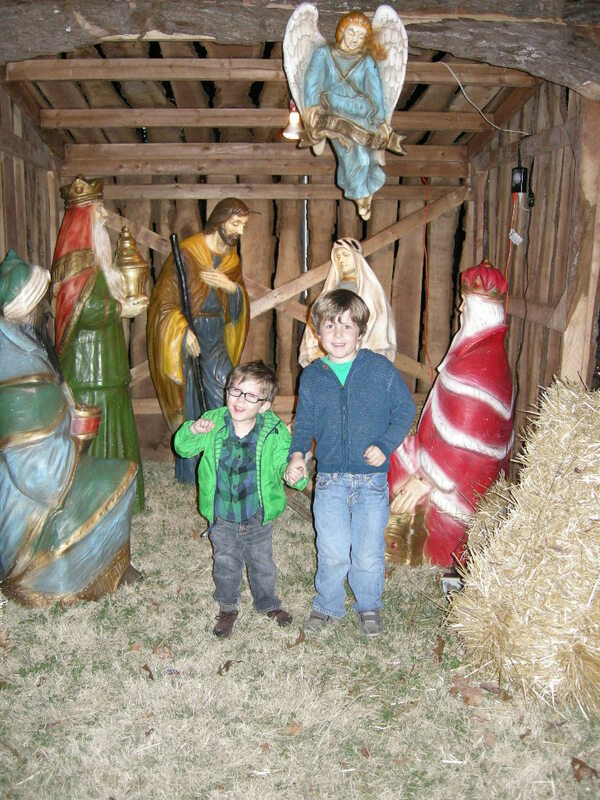 After going to the live Nativity at Grove Dental, we went to downtown Grove and took a few pics. I love that Grove still has the Nativity scene at the City Hall. The sweet ladies loved the boys... Will even gave out hugs :) And Jack was fascinated by their walkers...I think he wanted to take one out for a spin! 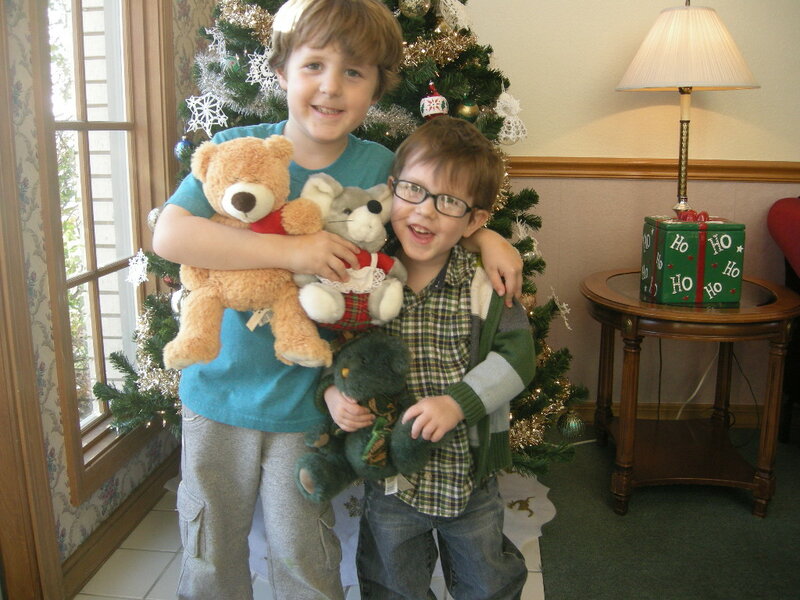 And, the residents even gave the boys stuffed animals to take home...this was by far the best activity we have ever done for Advent. 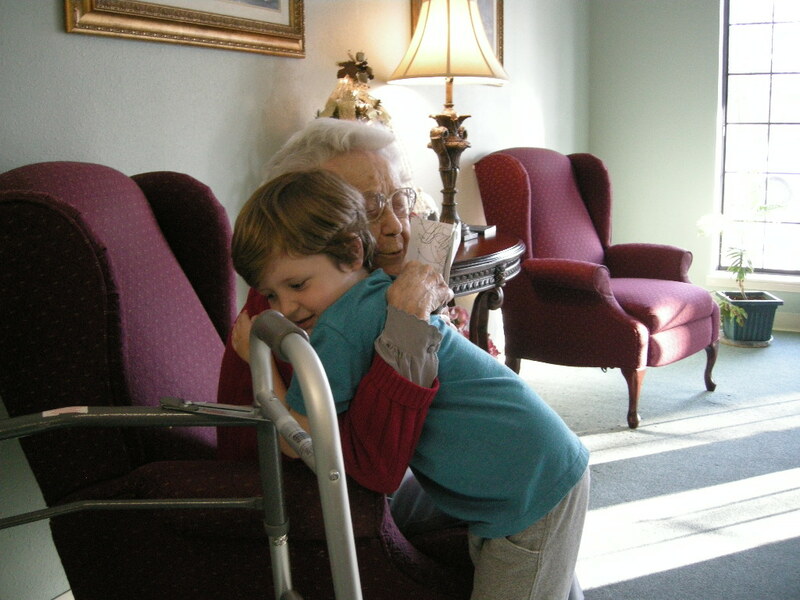 To see the joy on their sweet faces after receiving a card and hug was so special. I have wanted to post for a few days now, but my heart has been so heavy about the Newtown, CT devastation, a precious family who is sending their daughter home on hospice, and another friend who is facing trials, that the thought of putting anything to "paper" has just been too much. Every time I go to write, I tear up about all of these situations and I can't find the words for all of the pain these families are facing. I have also seen such strength and grace by these families. It finds me asking myself how I would handle something so tragic...it is a huge reminder to me that I need to be so secure in the Word and hide His promises in my heart daily. Because, when I dive into the Word, I see God's promises to us all...despite our incredibly difficult, painful, heart-wrenching, raw, unimaginable, heavy, unfair circumstances, He is the Light in the darkness. a time to weep and a time to laugh, a time to mourn and a time to dance." "Surely I am with you." Lord, let me focus on you and your promises and be a light to those around me. Let me teach my children to love their neighbor and love You above all else. Help the families who are grieving for their children and send angels to minister to them during this time. I pray the lost return home to their first love, You. We need you so desperately, Lord. Amen. Just taking a little stroll in our living room...don't you love how excited Will is for his brother?! It gets me all choked up to see the joy on Will's face-he has been through a lot the last 2.5 years too, and despite it all, he truly is Jack's biggest fan. That really blesses me as a mom...praise you, Lord for the joy You give us! 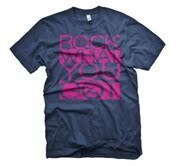 And, here's a little preview of our new shirt...we LOVE the design and meaning behind it. Inside of a few of the letters is a power chair, wheel chair, walker, and the glasses from the Walk by Faith tee. We went in with the idea of Rock What You Got (I just heard a song this week with these lyrics and really liked it) and having the other elements tied in somehow. We want to promote the notion of being perfectly okay with who you are and "rocking what you got"...that could mean a lot of different things, depending on the individual, so we are so excited to get this tee out! Pre-ordering will begin soon so check back to see the exact date. Listen to the song by Superchick! Here is an article I found on one of my favorite sites, The Works of God by John Knight (www.desiringgod.org). I found it very applicable and honest. I know some of you are praying you’ll make it through Christmas — just make it through — not anticipating anything good will come from gathering with extended family and friends. It has become a cliche — right next to the article on what second-graders are excited about for Christmas is the article on the rise in depression during this last month of the year. I really like surprises...well, let me explain. I like the actual surprise, but I am not very good at waiting on the surprise. Turns out, Will is a lot like his momma. Yesterday as I was wrapping up a few gifts in our room, Will came in and started snooping around. He found one of his stocking stuffers and I loudly said, "Will, don't you like to be surprised, you do not have to know everything before you get it!" I mean, this kid has always found out about every single gift or fun activity that we have ever tried to surprise him with. Seriously. 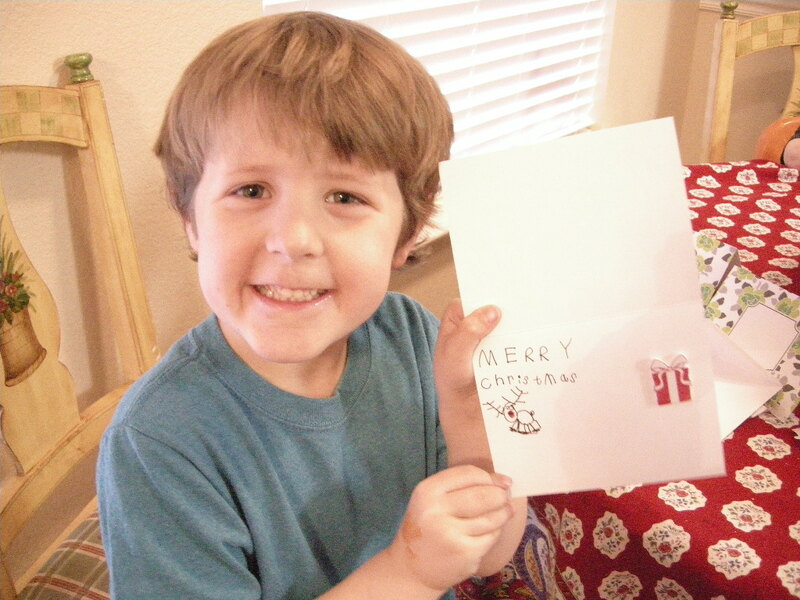 I continued to tell him that I just want him to enjoy his gifts from us when he receives them. Then, it just hit me...the Lord was using my child to speak to me about how I have been acting about "surprises" in my own life. See, I feel like I am in a period of unknowns right now. I have been asking myself, "Will common threads be successful?" "Will people rally behind families who have children with special needs?" "Where in the world can I work full-time in Grove?" "Should I even work full-time right now?" The list goes on and on. I have my answer from the Lord, the One who knows my every thought and the One who loves to surprise me with His best. He clearly said, "Tiffany, don't you like surprises?" "You do not have to know everything right now, enjoy where I have you today." So, I am choosing to trust in Him today and be patient...knowing that He will surprise me in His perfect timing. And, hopefully I can keep Will out of our hiding spots too! 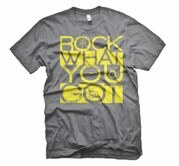 Watch the following video to see who won the Walk by Faith tee! Also, we are open at the Etsy Shop! Just go to www.etsy.com and search for CommonThreadsApparel. All of the colors and size options we currently have available are listed. If you want to order directly from us, we are offering a discount on the adult t-shirts of $21. Just contact us at sales@thecommonthreads.org. Thanks!! And, thanks to everyone who participated in our very first giveaway...what a blessing to ready your testimonies and receive so much encouragement from each one. The Lord has done great things! A BIG CONGRATS TO JESSICA HENDERSON!! Email tiffany@thecommonthreads.org with your shirt info! Our first t-shirt, the Walk by Faith tee is just about ready for purchasing...our Etsy shop will open this weekend and you can also purchase directly through us by emailing us at sales@thecommonthreads.org. I thought it would be fun to give you the history on how it was developed and a chance to win one for yourself! When the idea hit me a few months ago to start common threads, I knew I wanted the t-shirts to be unique, fun, modern, and something that anyone could wear...because after all, part of our mission is to unify those who have special needs and those who are "typical". So, Andrew and I walked into Big Fish (the amazing screen printing shop we are using) and sat down with Eric, our new graphic designer. I talked in circles for 10 minutes about a few thoughts we had, mostly about Jack's glasses, but did not have a concrete idea. I leaned over and asked Andrew if he had anything to add...he said he didn't really have anything else. So, we just sat there a little stumped...until, Andrew finally said, "Well, naturally, if we are going to use Jack's glasses, we should use the verse: We walk by faith, not by sight." BINGO!! We laughed and high-fived because we knew it was exactly what the shirt needed and we also knew the significance of the verse. So thankful the Lord gave Andrew the perfect Word for our first shirt! Well, how do you get yourself a free Walk by Faith tee? Comment below by answering the following question: What is an area in your life (past or present) where you have had to Walk by Faith and not by Sight? We will randomly choose a winner on Sunday, December 2nd! And, here are a few more colors we are offering...hope you love them as much as we do! 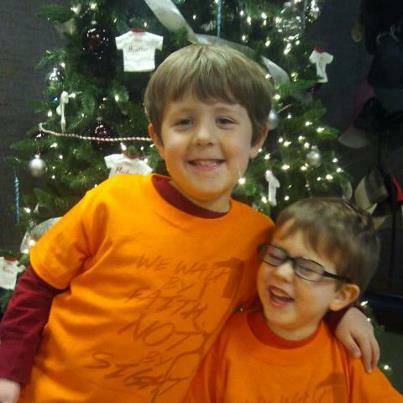 The boys sporting their new shirts at Big Fish! Advent- the Lord is coming, a time of expectant waiting and preparation for the celebration of the Nativity of Jesus at Christmas. Just reading those words causes me to pause and thank God for the gift of Jesus. But, last year I asked myself if I was really expectantly awaiting anything and preparing for a celebration...I realized that I needed to have more of a Christ-centered focus during the entire Christmas season. 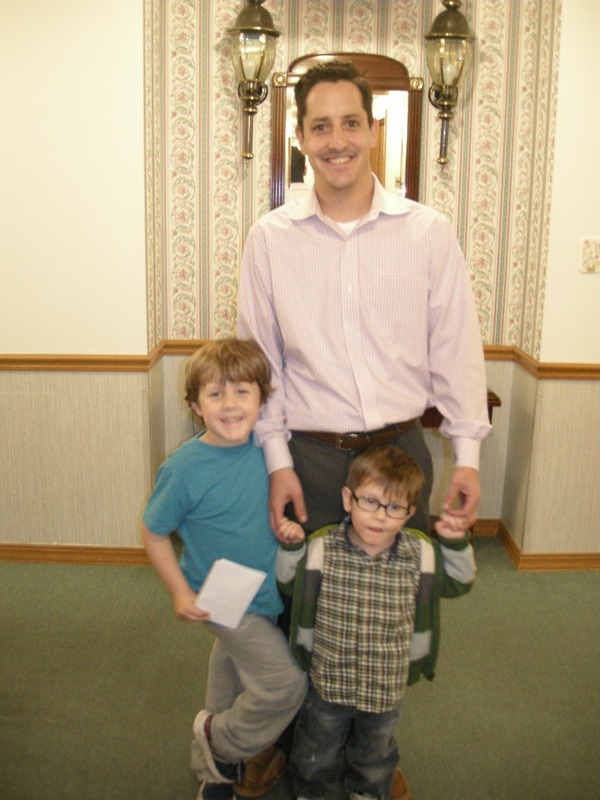 And, since I also wanted to pass this down to my sons, I decided to do something that included our entire family. I remembered reading a story of a mom who did "40 acts of kindness" on her 40th birthday so I thought I would tweak her idea and do something similar for Advent. 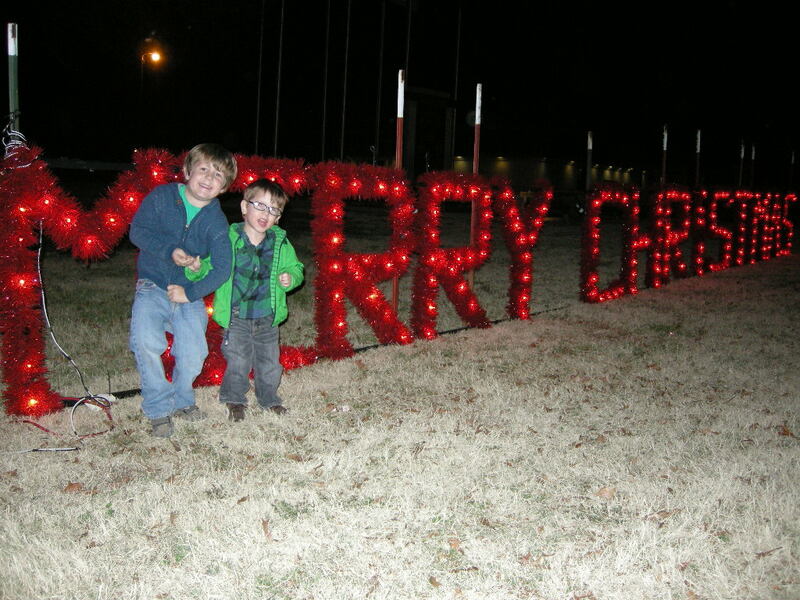 My desire was to stay focused on the Lord's coming throughout the month, teach the boys about the true meaning of Christmas through serving, giving, and showing love to those who may be forgotten, and spending quality time as a family. So, here are a few ideas for you to consider this season! Day 1: Leave goodies for your mail carrier with a note attached saying "We appreciate you! Merry Christmas!" Day 4: Leave dollar bills in random spots at Dollar Tree, Dollar General, etc. Day 8: Pray for an "enemy"
Day 11: Donate toys from the toy box to a nearby daycare, charity, etc. Day 13: Make handmade ornaments, garland, etc. I would love to know your Advent ideas, too, so please share with me! Lastly, I will leave you with this video from www.adventconspiracy.org...pretty powerful stuff. Be blessed as you expectantly await our Savior's birth! The prompting to begin common threads all started because of the following story...and our desire to encourage and support families who might have a similar story, while enabling others to get involved in our mission. "I am not sure exactly what is going on with Jack, but I am definitely concerned", said our doctor after months of noticing delay in our 9 month old son. An MRI was ordered immediately and we waited for 2 weeks to get an answer. But, I already knew in my spirit that we were looking at something very serious. So, on my 30th birthday, we found ourselves waiting in the doctor's office for the results. The neurologist came in to examine Jack after "not noticing anything alarming from the MRI" to go back into her office to look more closely at his results. And, after what seemed like forever, we hear these painful words, "After looking again, I did find something. I believe Jack has Cerebral Palsy." Time stood still and my heart broke into a thousand pieces. I looked into my son's beautiful blue eyes and wondered if I could ever be the Mom he needed me to be. And, I held onto my husband for dear life because I knew right then that our lives would never be the same. The days, weeks, and months ahead would be some of the most painful experiences of my life. And, I thought I had already been through difficult seasons with miscarriages, my mom passing away, and heavy financial burdens. There were times of extreme loneliness, grief, and guilt that seemed to suffocate me at times. It is only by the power and healing touch of Jesus and those willing to be used by Him that I came out of this better than I was before. It was not easy, or always pretty, but healing has come...and it might look different that you think. I am often asked how I reached this point after such pain and heartache with my child and I desperately want to encourage other moms who have special children. Allow others to help you-our parents, extended family, friends, therapists, and even complete strangers have been our biggest supporters through this journey and we are so thankful for their encouragement, love, and prayers. Also remember to reach out to those who can relate to you...we need to know that someone can identify with us. I know your pain and so does the Lord. Remember that as you read my story of healing-He wants to heal your broken heart too. Summers are always hard for stay at home moms, but this particular summer was even harder for me. The loneliness was unlike anything I could have imagined and I did not know how to battle it. Mostly because I hated feeling alone, but I did not want to be around a lot of people either. Even though I had a very typical experience with Jack's older brother, Will, it was still so hard being around others with typical children. It seemed like the disability was so noticeable all of a sudden. Now that we had an actual diagnosis, everything seemed to change. And, the more people we saw, the more questions we had to answer. I wanted to get on a loud speaker and just announce it to the world, "Jack has CP, but he is still Jack and God made him perfect in His eyes!" Too bad it was not that easy, huh? Throughout the summer, I isolated myself just enough, mostly out of self protection and not wanting to burden anyone with my issues. Well, along came fall, and that meant our MOMS group at church would start back up from our summer break. I knew I had two choices-drop out and completely isolate myself or return to MOMS and get support from the women God placed in my life for this season. I knew God's Word says that we are to carry each other's burdens and encourage one another so I decided to return to MOMS and pray that I would be open about my struggles. Throughout the next 9 months, I received so much encouragement, prayer, financial help, and love from these precious friends. On one particular occasion, the group laid hands on me and prayed over our family; it was so incredibly powerful to be the recipient of such prophetic prayers. And, so much healing occurred on that day for me. My "sisters" prayed things over me and for me that I had not shared with anyone. The Lord gave them the perfect words because He knew how broken I was. All I could do was thank Him for bringing me back to MOMS...to think that I might have missed out on healing because I didn't want to share my struggles is absurd to me now. Until I am reminded that the enemy wants us to isolate ourselves and feel all alone...but, the Lord wants us to fellowship and hurt with those who are hurting and encourage each other during difficult times. Although none of these women have children with special needs, they were all used by the Lord to minister to my broken heart. Truly the body of Christ is a beautiful thing. The pieces were starting to be put back together, and maybe, just maybe, my heart would overflow like never before. Well, after the loneliness had subsided some, the guilt crept in with demanding force. I started questioning and asking the "whys" and "hows". We knew there was brain damage, but we were never told why or how this happened. We may never know and that is hard. It could have been a stroke or something developmental, we just don't know. So, I remember asking myself at one point, did I cause this? What did I do wrong during pregnancy? Did my moms death cause me to stress too much and cause a stroke in utero? Did I not take enough pre-natals? Was it his jaundice? The list goes on and on. And, the questions I asked myself were so raw and painful, even now, after so much healing has occurred, I weep. To think you are responsible for your child suffering is difficult to swallow... to think of your child having a lifelong, incurable condition and you are responsible in anyway, is almost unbearable. At one point I went to my husband who was also hurting so much, and apologized to him. If he thought I did anything to cause this, that would kill me. He held me and we cried together, and he was so sweet to tell me that he did not blame me. Even then, I still felt guilt. I decided to share some of this with my OB-GYN and she looked me square in the eyes and said, "You let all of that guilt go now, in Jesus name. You did not cause this, the Lord made Jack and he is fearfully and wonderfully made. He will get you through this...if you allow Him to." Wow. Her words were so powerful and I prayed to let the guilt go, all together. I wanted to love Jack for just being Jack...I wanted him to know his momma loved him and did not have guilt about who he is. Because he is an amazing, wonderful, child of God. I believe our children are very aware of our fears and insecurities about them. I did not want Jack to feel insecure about my love for him so I stopped asking "why" or "how" and allowed the Lord to heal this part of my heart too, because I wanted to trust in Him so completely, even though I may never know why my child was given this condition...His ways are not my ways and His thoughts are not my thoughts. He has always loved Jack, just as he is and Jack needs a mom to love him like this too. And then there was grief. Why my mother-in-love mentioned to me that I needed to let myself grieve, I was not prepared for all that entailed. She knew that I was struggling and needed to allow myself to grieve so that I could heal, too. So thankful she loved me enough to speak so much truth in love to me. Of course, I thought I knew grief from losing my mom...but this was totally different. I had to grieve for my child, my child that I still get to see everyday. I really did not even know where to start. But, it hit me square in the eyes one day. As I watched Jack in physical therapy, I started grieving the child we had for 9 months without a diagnosis, and letting go of all the previous dreams we had for him and started to dream NEW dreams. It was as if a light bulb went off in my head that day- just because Jack may not have the life we initially thought he would, doesn't mean that his life cannot be great and purposeful. The Lord started to show me that he was using Jack to encourage and minister to others in a big way. He is able to draw people into him in such a special way. I have seen hearts softened and burdens lifted and I believe the Lord has given him this unique ability. When I think about what I want for my children more than anything, it is for them to love the Lord with all of their heart, soul, and mind. And, love their neighbor as themselves. I see Jack doing this and when I do, the grief is gone. Instead of grieving the child I had, I praise God for the gift in front of me. So I mentioned that healing has come...is Jack completely healed of Cerebral Palsy? Is he independently walking at 3 years old? Does he say 3 word sentences often? The answer to all of the questions is "NO". But, I have seen so many miracles of healing the last 2.5 years. Undoubtedly, healing has come, in the most amazing ways. My broken heart has been healed because I have seen the work of the Lord displayed. And, this situation has also set me free from other strongholds in my life like insecurity, comparison, and worry. What an unexpected blessing to receive. Also, my husband's faith has been transformed and renewed in such a powerful way. Will has a tenderness towards others who might be a little different from him and so much compassion and love for his brother. Jack has persevered through so much and continues to surprise us with new victories everyday. He keeps me grounded with the right perspective...a constant dependence on the Lord for everything in my life. So, although there are still hard days when I want so much more for Jack, and yes, I still pray for a complete healing on his body, I praise my God for the healing He has already given us and pray I always stay completely dependent upon Him because that's the BEST place to be.